Personalization Engine Auto Tagging is an individually priced product offering from Sailthru. As users browse your site, Sailthru’s Personalization Engine technology records interests to their profiles based on the Sailthru tags on each page. These interests are compared to the interests of users across your site to help Sailthru recommend further content or products that match each user’s unique interest profile. 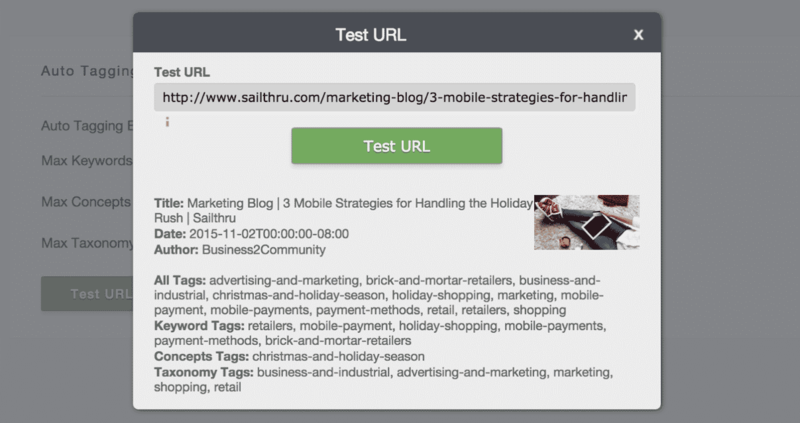 The Auto Tagging option from Sailthru is an easy alternative to manually tagging your content. If you are not already tagging your content or using an existing integration that produces tags (for example the Sailthru WordPress plugin), Auto Tagging could be the right solution for you. Auto Tagging uses textual analysis and works best when applied to pages with text content. It can produce three types of tags for each page: concepts, keywords, and taxonomy tags. The differences among these tag types are explained below, but most importantly, you can preview the accuracy of each type and determine which (and how many of each) should be generated for your content pages to achieve the maximum effect. Speak to your Customer Success Manager to discuss whether Auto Tagging is the right solution for your site. The CSM can turn Auto Tagging on for your account, which will add a new Auto Tagging settings page to my.sailthru.com. 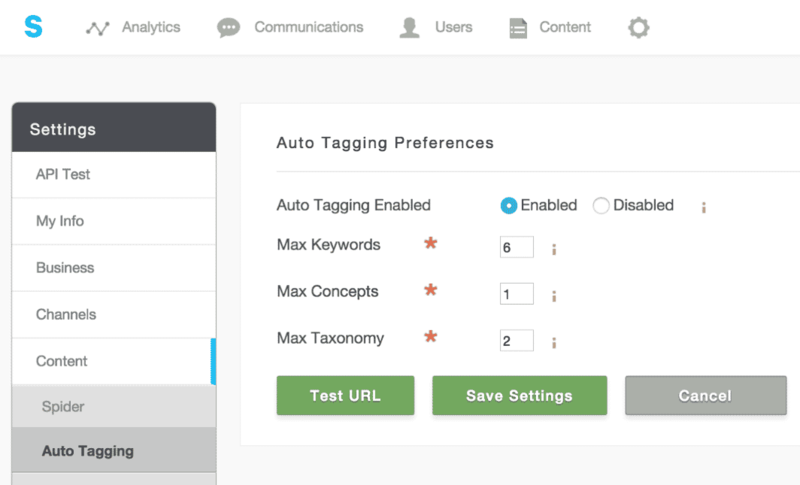 There, you will be able to test Auto Tagging for individual pages before choosing to enable it for your site. When Auto Tagging is turned on, you can access the Auto Tagging Preferences page at my.sailthru.com by going to Settings > Content > Auto Tagging. Keywords are the important words that we discover in the document as written. We rank them by relevance so only the best keywords are included (up to the maximum number you specify). Concepts are brief descriptions of the content. Concepts might not include any of the text on the page but will identify what that content is about. For example an article discussing the President’s reelection chances may not mention the word “politics,” but “presidential-politics” may be identified as a concept tag. Taxonomy tags are topic categories, matched from a predefined, Sailthru-provided database. Based on the accuracy of these tags across your test pages, choose how many of each type should be generated for all of your pages and enter these numbers on the preferences page. For example: Entering 6 in the Max Keywords box, 1 in the Max Concepts box, and 2 in the Max Taxonomy box will generate a maximum of 9 tags for each page, with Keywords representing the majority. However, all tags will be used equally by Sailthru and may be identified as user interests. It is recommended that you produce a total of no more than 10 tags for each content page. If you want to prevent one type of tag from being generated, just set its max number to 0. When you are happy with the results, set Auto Tagging to Enabled and click Save Settings. How do you know auto tags are working? Once Auto tagging has been turned on you’ll start to see those tags applied to content in your Content Library. How does this work with existing Spidering settings? No automatic additions to the content library. No automatic additions to the content library. tags — keywords you have provided within the code of the page. tags — Automatically produced by Sailthru based on your chosen quantity of tags for the keyword, concept, and taxonomy categories during Auto Tagging setup. How do I know if Auto Tagging is right for me? Your Customer Success Manager will help guide you in the decision based on their knowledge of your existing strategy. But if you are not currently tagging pages and don’t intend to do this manually then you are likely a good fit. Does this work well for e-commerce customers? This will work better for pages that have text that can be analyzed automatically. We’ve found that results for e-commerce product pages aren’t as strong as those for longer text content such as articles, but we encourage you to run some tests. You can also talk to your Customer Success Manager to see if we have an integration that tags pages automatically for your e-commerce platform. We have integrations with various e-commerce platforms that also offer a number of additional benefits.